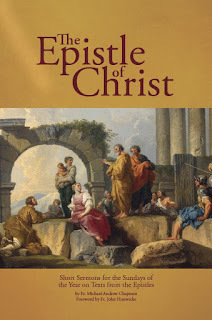 Our friends at Arouca Press have released a new book, The Epistle of Christ, by Fr. Michael Andrew Chapman, with sermons for the Epistles of the Liturgical Year (the Traditional Latin Liturgical Year). The book will surely be of great value for both devotional purposes and for priests looking for new insights for their sermons. Like the brilliant and witty Knox, Fr Michael Andrew Chapman (1884-1960, priest of the Archdiocese of Indianapolis) was a convert from the Anglican priesthood. His life spanned very nearly the same period as that of Knox; like Knox, he must have honed his ministerial skills in the Anglican Ministry, in which he had spent ten years (1908-1918). That is, Sunday by Sunday he preached, very probably on the Epistle or Gospel of the Sunday. And he wrote his sermons out! So, when such a man made the transit from the Anglican to the Catholic Ministry, he had already preached year by year on the Readings of the old ‘Tridentine’ Rite. This is because the Epistles and Gospels of the Anglican liturgy were the same readings as those in the Missal of St Pius V, with only a few minor differences. They were taken from the Sarum Rite, the medieval English version of the old Roman Liturgy. And that series of readings, evidenced in the Comes of Würzburgand the Comes of Murbach, probably takes us back to the lectionary system in use at Rome as early as the fifth century. In other words, until the Second Vatican Council, they were the selection of readings which nurtured the piety of clergy and people for a millennium and a half. The list of books which the Church regards as authentic Scripture, contained in a decree of the Council of Trent, is called “the Canon”. Sometimes we hear a phrase “the Canon within the Canon”. In other words, the reference is to portions of Scripture deemed to be those most central to the Divine Message of the entire Bible. The phrase is used particularly in Protestant circles of a small group of texts in which the Protestant tradition has considered itself to find its central doctrine of “Justification” as that was (mistakenly) understood by the sixteenth century ‘Reformers’. This means, of course, that the selection of books regarded as belonging to this Protestant “Canon within the Canon” is purely subjective and idiosyncratic. But I would like to suggest that, for Catholics, there is a Canon within the Canon: and that it consists of those portions of Holy Scripture which by very ancient custom have been publicly read, century by century, year after year,within the Church’s Worship. Because the Bible is the Church’s book. The literature within it was written within the Church and for the Church. The Bible was not composed so that individual Christians might read it privately for their personal enlightenment. A great deal of study has been done in academic circles during the last few decades on the relationship between ‘Orality’ and ‘Literacy’ in the ancient world. The tendency has been to see the written word as backup for the spoken word in a basically ‘oral’ culture. (A loose modern parallel might be the cookery book you keep in your kitchen: it is backup for your culinary triumphs.) So the Holy Bible did not drift down word-perfect from the skies; it emerged from the lived reality of Church life in which it supplied needs and preserved orthodoxy and built up the People of God. Catholics are often exhorted (I have done it myself) to read the Bible more. They naturally wonder how to go about it. Does one purchase a Bible and then get to work on the first verse of the first chapter of the Book of Genesis … and then just carry on? I suggest that a better method is to study the passages of Scripture appointed for next Sunday. We clergy are sometimes tempted to preach mainly upon the Gospel. This is natural: here are the words of Christ Himself, the Incarnate Word; and perhaps the Gospel narratives are a little more vivid than the Epistle readings. So I much welcome this little book as a godsend both to laity and clergy. There is immense wealth in the readings of the Epistles, most of them by that towering intellect St Paul. Perhaps clergy will make its texts the basis of their own homilies, or perhaps they will simply adopt its methods and thereby preach more effectively from the New Testament Epistles. And I commend it to the laity as a valuable prop in their own study of next Sunday’s Epistle! Priest of the Ordinariate of our Lady of Walsingham, sometime Head of Theology at Lancing College and Senior Research Fellow at Pusey House, Oxford.